Website Commercials take imagination, patience and of course the proper tools. Not all website commercials are created using a camera. If you begin paying attention to website commercials or T.V. commercials for that matter, not just to it’s message but to the assets or art being used. Notice how most everything is animated / created using still shots with fly-in text. Or using an in-animate object to present a product. (Like Snuggle for example) In this article I am going to share with you facts and steps about a cool piece of software called Adobe After Effects. This software has been around for a while and has had many upgraded versions. The one I am using is Cs6, the newest version as of the time this article was written. I am going to demonstrate to you some cool attributes Cs6 has and how valuable it is. Not only to advertising for it’s creative tools, but it’s also a ‘staple’ in Hollywood, for the special effects that you see in those multimillion dollar productions that ‘blow you away’ at the box office. With After Effects (AE from now on). With AE you can animate just about anything you want, or that your client wants in their website commercials. Below is an example of using a still photo, or graphic and have it come to life. IGE: A Hotdog company wants their logo to be animated, yet does not want to commission an animation artist to draw a composition of frames to have their logo say a few words in their website commercials or T.V. ad. Instead the company has a smaller advertising budget but would like the major part of the commercial done showcasing their product. Then at the end, or at sign off of said commercial they want their Logo, which happens to be a smiling hotdog, to invite viewers down, take a bow, or whatever?? Re-enforcing their branding with a logo or character. 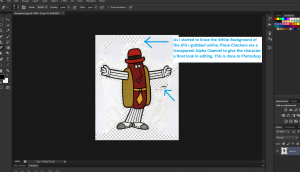 In this example I used a hotdog ‘pop’ dancing for fun. One way to do this is with a tool in AE called ‘Pinning’. There is an icon within the workspace interface that has a little icon that looks like a push-pin. (Fig2) The Animator like me at NetCommercial, would use those pins, to pin or mark the areas desired to animate, or move, within your website commercial. Pinning is not as terrific as having an artist draw it up as a cartoon. Due to the fact you get 3 dimensions with an Artist drawing up a figure. However for only a 3 second spot at closing, perhaps a ‘pinned’ jpg will suffice for your website commercials? Considering one can have a still jpg animated for about 85% less then commissioning an artist to draw a 5 second cartoon. 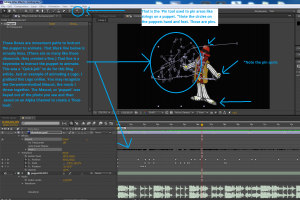 That pinning tool is used to mark, or pin the joints of an area the animator would like to have animate for use in their website commercials. (Fig 2) The challenge being when placing a pin into a solid piece of art, the whole picture tends to move. Solid, meaning, (Fig 1) a graphic that is one graphic and not separate assets, or Symbols as they are called in Flash animation. (Which we have over here too.) Separate assets would be the arm, leg, body, head, etc, as stand alone art that can be animated. When they are a solid. IGE: DerWienersnitzel mascot that I used for an example, was one solid piece of art. (Fig 1) I Grabbed off the Net, background removed. If using the pin tool to animate the legs, when instructed the pin will animate where ‘pinned’. Yet, unfortunately it will animate the whole picture as well. This is why I removed the background, plus it looks better to have just the figure dance around instead of the 4 corners of the background. To overcome the whole picture moving, there is another tool in there called ‘Starch’. The Starch tool is used on areas you don’t want to move in your photo or asset. Starching is used to freeze the rest of the photo so when instructed, your pinned area moves while the rest of the asset or picture stays still. Thereby creating an animation effect as though just the legs are moving. Albeit limited. 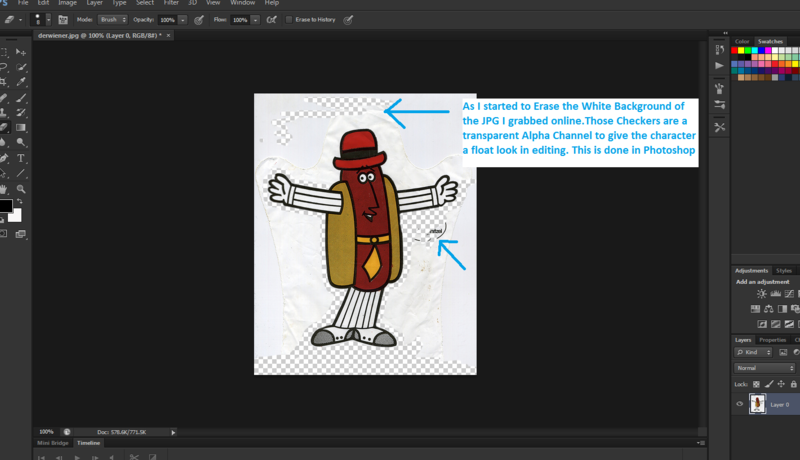 For instance the Hotdog animation has some warbled, or twisted areas to the picture when animating. To overcome that would take hours of ‘starching. Or at that point.. One can decide to commission an artist for the drawing of separate assets to then be animated. Then you get 3D so your animation is much better. When getting into animating there is a fine line if one should bust out their 700 dollar Wacom Tablet interface, so that the assets can be drawn, or to painstakingly ‘pin’ the solid asset using the ‘Pin’ and ‘Starch’ tool in AE. However for all intent and purpose I think you get a good idea of what you can do. Depending how detailed and what you want your logo to do, this is when time vs. money comes into play. I am sure there are subtle defects that are noticeable in my example, yet that is a 16 second clip, much longer then a 5 second sign off. 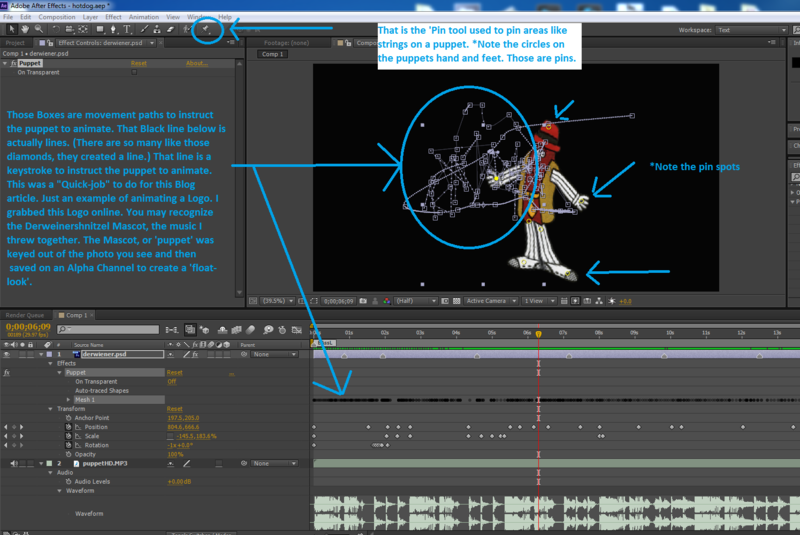 Furthermore, over exaggerated to show the widest movements available in AE. If commissioned, I would have spent days animating instead of a couple of hours. Plus it would have been shorter time frame with 70% less animating, allowing for detail. Along with not so long as to notice any subtle defects. Take a look. So you think that is a neat and memorable idea to have your logo animated. Not just a GIF but an actual animation, or even to have one with a voice. To get that handled you will need AE of course. Most likely you will need to ‘tune-up’ your asset in Photoshop. (See Fig1) Photoshop is made by Adobe too, and is a staple in any editor’s workspace. Photoshop is where virtual studios are created. Then Exported into AE to add any effects or movement desired. IGE: Flashing Monitors, lighting effects, text, textures, shapes, etc. The beauty of AE is that you can export your completed project from AE, ready to upload and publish for use on T.V. or for website commercials. You do not have to export your AE file to another editing software, to then export your website commercials. AE will export it just fine as it will let you add your voice over track too. In many acceptable formats, at industry standards. Yet, you will need to create a voice over track and that will require a decent microphone and interface. More then a $100. for a mic, but not more then $500. will suffice. We have a couple of interfaces, but have found once again Adobe is in the lead with Adobe Audition. Couple hundred will be spent for that software. Or you can do it on the cheap with Audacity for your voice-over interface and GIMP for your Photoshop needs. Both open-source and free. However AE is not free. As for voice-over, you can do it yourself, or hire voice over talent. We at NetCommercial have two voice over talents we use. They are used in Home Depot & Lowe’s commercials just to mention a couple, you may recognize them if you heard them. For one, ordering your Website Commercials would free you up to do what it is you do, that you are already successful at. Along with saving the expense of not having to potentially buy a Wacom tablet, $500 on a good day. Buying AE for $3-400, buy Photoshop for a $200. Furthermore, one needs a fast computer with an expensive Graphics card to harness the power and access all the options in AE software….That could easily turn into a $2500 dollar minimum swing if so inclined. Then there is the tutelage of learning about the ‘pin’ tool and how to properly use it. Learning how to use Photoshop to clean up your Logo or asset. Or, if you want your commercial to be an animation, you will need to buy, then learn Flash Pro by Adobe, or ToonBoom Animate. Which of course we have both over here at NetCommercial. Flash is cool check out my article on it here. Flash Video allows you to add a Hyperlink or URL in the ad so if you park that ad somewhere, all a viewer must do is too click on the ad link, which it will then bring the viewer to a landing page. Like this one. Scroll down, see the X-mas ad, I ran with a link. NetCommercial is offering a basic website commercial for 399.00 complete! Hurry, soon this offer will be gone and you will be wishing you had grabbed one, as your website commercials should have a shelf life for a couple of years. That $399.00 divided by 24 months, is about 16 bucks a month towards your virtual storefront. We at NetCommercial LOVE what we do, we love referrals and because we have the right tools, makes our job a little easier and quicker. We all know time is money, so save some money now for a limited time offer. As always, we love to hear your opinion and ideas, so please make a comment below. Due to spam bots please include the phrase “Website Commercials with AE” so the moderators know you are an organic comment.